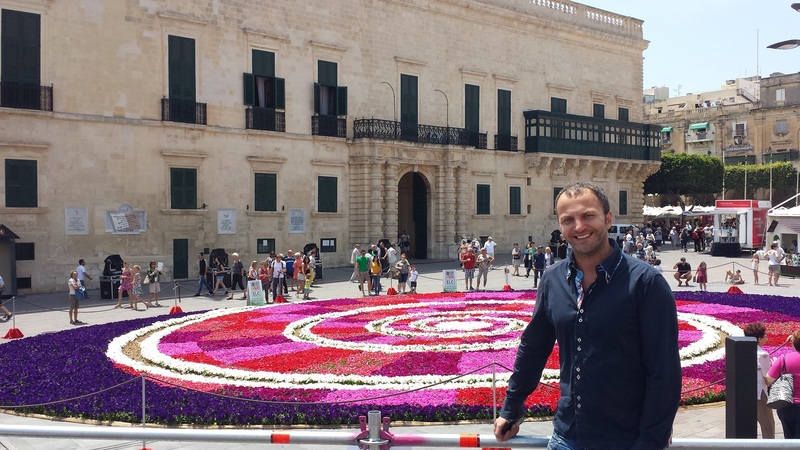 Creator of the infiorata’s design Daniel Mercieca with the finished product. This morning, music and colour filled Pjazza San Ġorġ. Performances by Recycled Percussions were heard throughout the Square and its surrounding areas, while the colourful infiorata dominated centre stage – giving the Square a lively jovial atmosphere on this sunny Saturday morning. For the design, Mercieca was inspired by the spirals found in the Megalithic temples. “The idea was to use something that wasn’t cliché. I wanted to use something Maltese but which hasn’t been overused, so a lot of thought went into it.” Other inspirations for the piece were crop circles, as well as the environment itself. To really zoon in on the environmental factor, recycled mulch was used in the design. In the end, all his hard work has paid off and he’s quite happy with how the general public reacted to the infiorata. “I’ve read comments in the papers and I was surprised by all the positive feedback,” he says with a smile.